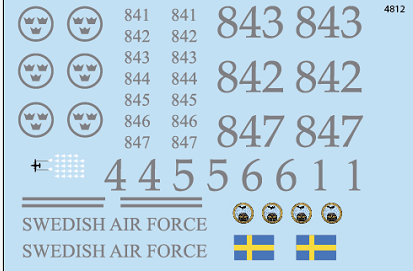 The digits on this sheet allow you to build any of the Swedish Airforce gray painted airframes of Tp84 Hercules. Flags, squadron badges and a set of tanker mission markings are included. For reference - there are many images online. They are fairly easy to find via Google. Motives are printed on very thing solid decal film and they must be cut out before dipping in lukewarm water and applied to model kit. A useful hint! When you decide what colur to paint your Hercules in, paint a sample area, let it dry and apply a digit that you are not going to use. It is a shame if it is the same colour as the decal.